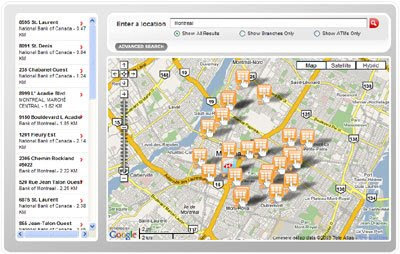 HSBC Bank Canada have produced a Google Maps mashup to help customers locate bank branches and ATM's. The map allows users to enter any address and find their nearest HSBC bank or ATM machine. It is possible to view both banks and ATM markers on the map or select to view just banks or just ATM's. The locations are shown both on the map and are listed in a sidebar. When you click on a bank or ATM marker it is also possible to get driving directions.